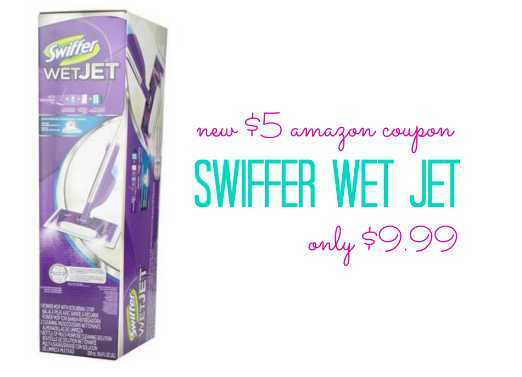 $5 Swiffer Wet Jet Coupon | Only $9.99 On Amazon! Home / Deals / Online Deals / Amazon Deals / $5 Swiffer Wet Jet Coupon | Only $9.99 On Amazon! We have some new Swiffer Coupons available on Amazon today including this high value $5 Swiffer Wet Jet Coupon + the Swiffer Wet Jet is on sale for $14.99 right now which means after you clip this coupon on this same page you will pay just $9.99 and get Free Shipping if you have Amazon Prime. $9.99 + FREE Shipping with Amazon Prime! Remember, Amazon Prices can change at any time, make sure you double check the prices on Amazon before you purchase. You will need to log in to see this Amazon Coupon because it should be tied to your account. Look under the price where it says $5 Coupon to clip the coupon and apply it to your order. The coupon should come off at checkout once you click the link. National Pretzel Day 4/26 = FREE Pretzels! Dance Clothing On Sale! As low as $9.99!